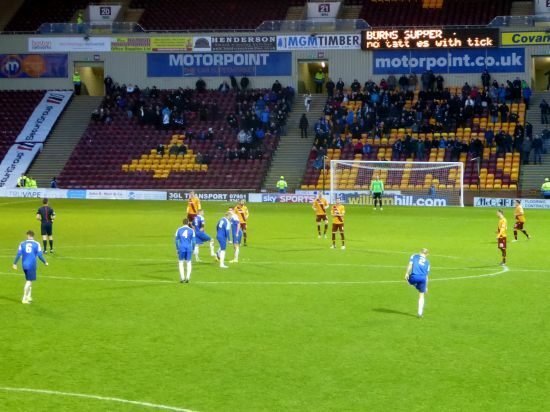 Motherwell brushed aside the challenge from Cove Rangers with a ruthless starting spell that had the game over as a contest after five minutes. The 5-0 final score puts us in Monday's fifth round draw of the William Hill Scottish Cup. The manager took no chance of risking a cup shock by fielding his strongest eleven against the Highland league hopefuls but the 300 odd who braved the long journey through the winter weather were soon made aware of the gulf that separated the sides. With one minute on the stadium clock Moult converted an easy header at the back post to set us on our way. The net in front of the Cove fans was to be breached on three more occasions before the break as McDonald, Johnson and Pearson grabbed their share of the spoils. Johnson’s pace allowed him to skip into the box almost at will as he teased the right side of the visitors’ defence. He was teed up outside the box from a couple of corners and was on target with powerful drives. The fourth goal followed a rare attack from Cove. A cleared corner allowed McDonald to release law as we charged to the other end of the pitch. Moult collected and set up Pearson on the left to set the team at ease with a four goal cushion at half time. That only one goal was added in the second period was as much due to our sloppy finishing as to stout defending. Pearson got his second in 62 minutes with a well placed finish from the angle of the six yard box as the game turned into a training exercise. McDonald might easily have scored another three had he taken the chances to finish from close range. 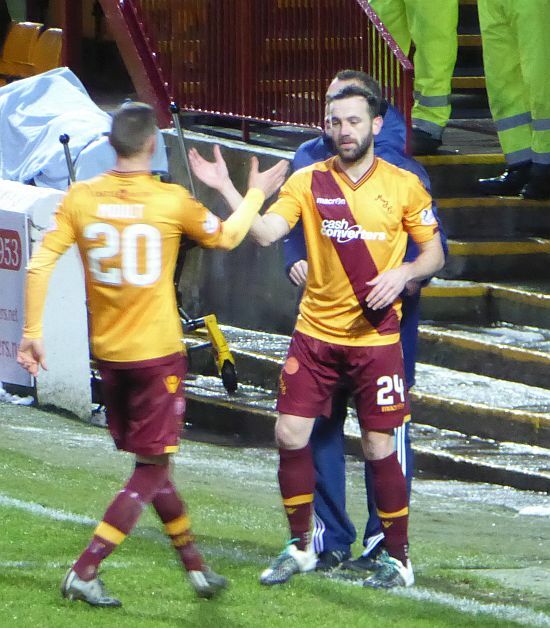 McGhee gave Ainsworth and Thomas a stretch but the biggest cheer of the afternoon was reserved for the appearance of McFadden back in claret and amber for his third spell at the club. Cove were robbed of a consolation in the dying minutes when a goal line clearance was needed and they might have had some joy in the first half when Yule and Walker were given room to fire at Ripley’s goal. We look forward to Monday’s fifth round draw.